My copy was the Deluxe Illustrated Edition, January 28, 1947 Penguin Group with Louis Jambor illustrations. I loved the illustrated color plates and the pen and ink drawings that accompanied many of the chapters. I clearly remember a little bird drawing that accompanied a chapter about Beth’s recovery from illness, but the cover was my favorite. This color painting shows all the girls gathered around the little spinet singing while Marmee played. Jo stands behind Marmee, while Amy and Beth sing opposite her with Meg’s back to the viewer. So, it was with some concern that I noted that the Common Core recently released their language arts curriculum standards with suggested reading lists for grades 6-8. Little Women is on that list. I was hoping that Little Women was a just a suggestion, perhaps as an independent reading text, but a recent seminar I attended at the ISTE 2011 Conference (International Society of Technology in Education) in Philadelphia confirmed a great fear that some educators will consider the novel a “teachable text”. The presenter at the seminar enthusiastically explained how many interesting links to Louisa May Alcott and her books could be researched by students. She demonstrated several different web quests dedicated to the study of Little Women and explained how these might be incorporated in language arts curriculum. I sat there horrified. I have no argument against a student choosing to research this novel or the author on her own. Perhaps the information will even deepen a reader’s love for the story. But to assign the Little Women? Please, no! 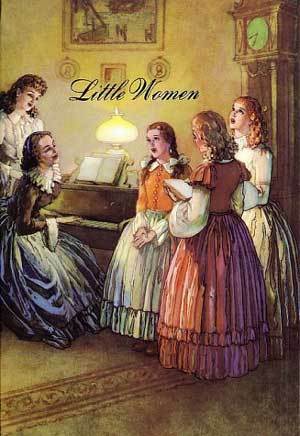 If I had been assigned Little Women, would I have lingered over every page? Would I have felt that sense that Louisa May (she was too familiar to me to be called Alcott) was speaking to me, or would I have been looking for theme and symbols? Could I have been Jo if I was competing with other young girls who felt that same kinship with Jo? Would Little Women have been the same learning experience with an assigned vocabulary list? Would I have passed the multiple choice quiz or essay test? Actually, my multiple readings would have assured a decent passing score, but would testing have assessed my deep relationship with the text? Sadly, if well-intended educators are using the Common Core suggestions as texts to teach, Little Women will be placed in some curriculum. The novel is in the public domain, so digital texts can be accessed at no cost which makes the text attractive for low budgets. However, I shudder to think a student will be forced to read the novel rather than discover the story on her own. And although I am not gender-biased with literature, I would not assign this novel to pre-teen boys. This list does offer variety, and the inclusion of The Adventures of Tom Sawyer offers a more challenging read for this level. I would also advocate that A Wrinkle in Time should be a suggestion for independent reading as well. But, please, teachers, assign any of the above texts and leave Little Women to the young reader who chooses to read the novel. The unforgettable story of Meg, Jo, Beth and Amy March is for a reader to discover, not for the lesson plan. 2 responses to Please, Do Not Teach Little Women! I understand your concern and share your love of the novel. However, I believe it to be a wonderful text to teach. My students are not the kind of students who would willfully pick up a book called Little Women; they would look at it once and put it down, moving on to something more exciting. They need to be exposed to a variety of texts. Teaching the book properly will still allow them to delve in and get lost in the world of Jo! Did you loathe The Count of Monte Cristo? Fahrenheit 411? Romeo and Juliet? Great Gatsby?